Why is a mural like this important to the Memphis community? Installations such as the Upstanders Mural are vital to communities because they remind the viewer of those who have endured difficult circumstances and gone head to head with adversity in order to make Memphis, our country, and our world a better place. This mural reframes Memphis’ history and provides a space, where we can tell stories, some of which have gone untold before now. How does public art help us understand history and the world around us? Public art highlights spaces that might otherwise be ignored. It makes an ordinary, and often unnoticed, wall into a canvas that tells a story and awakens our minds. Murals often make a statement or offer a narrative, inspire thought and discussion, and perhaps even action. What do you hope people will take away when they walk by this mural, especially young people? What is the most important lesson we can learn from the 14 Memphians featured? Perhaps the most important lesson is to understand that these Memphians were ordinary people like you and I who made an active choice to stand up against injustice in order to contribute to the well-being of their community—of our community. They could have been bystanders, but they chose differently to benefit the greater good. How are young people at the National Civil Rights Museum interacting with the mural? I use the Upstanders Mural as a teaching tool to show students the faces of individuals who have sacrificed in order to help others. I ask students to consider what each of the Upstanders on the wall did for the world and how their lives and their work made a difference. Then, I ask students to consider what they can do to make their community a better place. Will they pick up litter? Stop a bully from bothering a classmate? Offer someone who has fallen a helping hand? We look at what we each can do to be an Upstander today, tomorrow, and for the rest of our lives. What is the significance of having this artwork in Memphis, particularly with its proximity to the Museum? 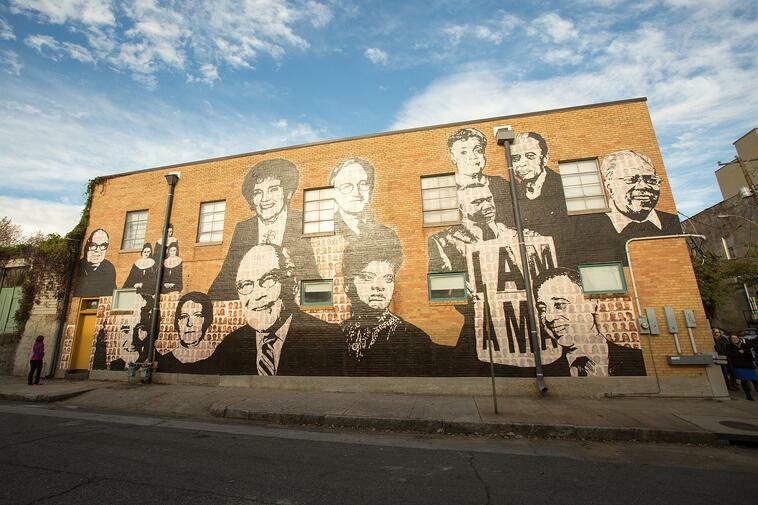 We often talk about many great leaders of the Civil Rights Movement, and so many of their stories are told at the National Civil Rights Museum, but with the Upstanders Mural, we see portraits of ordinary Memphians, and people who aren’t as widely known, who took extraordinary actions. We see the faces of noble activists, including Rabbi James Wax, who advocated for equal rights for African Americans; Ms. Ida B. Wells, a courageous educator and forthright journalist who spoke out against lynchings; and Dr. Sheldon Korones, a heroic neonatal physician who made medical care accessible to thousands of families with sick babies. These Upstanders were each guided by their own moral compass. What they share is that they all made the choice to impact their community and through their activism they changed history. Their actions benefitted so many Memphians and will continue to do so for generations to come. Now, more than ever, it is important to realize that individuals and their efforts can make a difference. Acknowledging some of those efforts inspires us to ask ourselves how we, as individuals, can make a difference today. Want to see the Memphis Upstanders Mural for yourself? If you're in Memphis, feel free to stop by at 115 Huling Avenue. Not in Memphis? You can still view the mural and all of the Upstanders that are featured. McKinley Doty is the Facing History Together Coordinator at Facing History, Memphis.